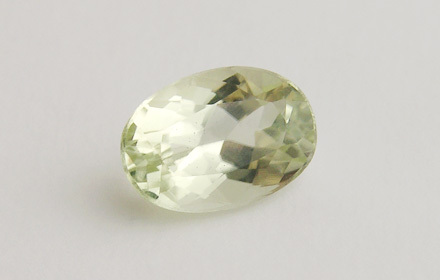 Weight: 1.49 ct; size: 8.38 | 5.89 | 4.42 mm; shape: oval; colour: medium light yellowish green; very slightly greyish; clarity: eye clean; cut: fair; treatment: none. Late stage hydrothermal mineral in granite pegmatites (Arem, 1987: 111). Faceted specimens are very rare.